If you�re a Texan who is serious about boating, you already know about Kemah. 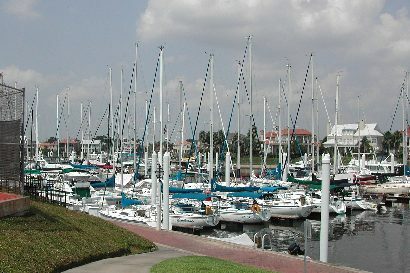 Home to the third largest fleet of recreational boats in America, Kemah is unique. This is where boots, jeans, and longneck beer meets flip flops, cut-offs, and well� longneck beer. Like the offspring from a Maui and Ft. Worth marriage, Hawaiian shirts and pickup trucks dot the parking lots of the bars, restaurants and marinas throughout town. But the rich Kemah history makes it much more than just another Texas coastal town. 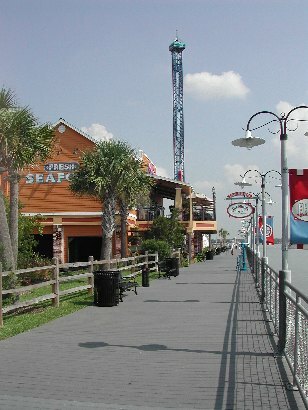 Kemah is located on the south side of Clear Creek Channel. The Channel connects the briny Clear Lake with Galveston Bay. About twenty-five miles northwest of Galveston, and thirty-two miles southeast of Houston, Kemah is easily assessable by State Highway 146 and Farm Road 518. 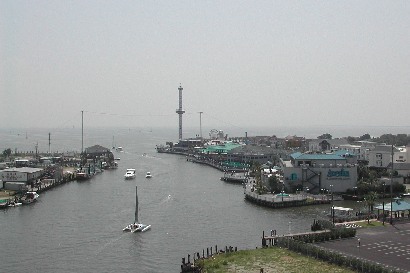 Legend has it that one of Kemah�s first inhabitants was the pirate Jean Lafitte. It is even rumored that he buried much of his stolen treasure around this horseshoe shaped section of Galveston Bay. There are still some long time residents who profess that some of Lafitte�s treasure was used to fund much of Kemah�s illegal and notorious gambling days shortly after World War II. The town began as a result of the Southern Pacific railroad passing through this small section of Gulf property. Then, around 1898, the largest landowners in the area, the Bradford Family (headed up by James H. Bradford) and Kipp Family (with John Henry Kipp as the head of the household), created the township of Evergreen. It was also called Shell Siding at times because of the huge amounts of seashell hauled by the railroad from the Bradford family property. Evergreen grew to point where J.H. Kipp wanted citizens to have their own post office. However, he was told there was already a town with that name. If they wanted a post office, they would have to come up with a new name. Eventually, Kemah was chosen. It means �wind in the face� in Indian, which, if you�ve ever been to Kemah, you can appreciate how easy it was to come up with that name. The population of Kemah remained around 100-200 citizens for the first third of the 20th century. It began to grow in the late 1930s and early 1940s to over 500 and held steady until 1965. Since then, the boating industry has taken off as well as Kemah. With easy access to the Gulf of Mexico, the construction of dozens of new marinas, and numerous Houstonians anxious to spend their weekends on the waterfront, Kemah has sextupled in size to a population of about 2700. Kemah, once a slow coastal town is now more upscale chic. Waterford Harbour, the gem of marinas along the Texas coast, is a focal point in the development of this town. There is also the Kemah Boardwalk. A 14-acre complex, the Boardwalk is complete with themed restaurants, hotels, amusement rides, marinas, and even a miniature train ride. But, Kemah�s more lasting attributes are less tangible. The warmth and friendliness of the residents completes the picture. And this may be the real reason why Kemah is a true Texas paradise.